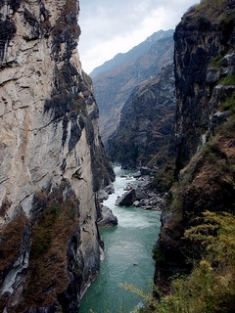 (July 6, 2012) Experts fear a proposed dam cascade slated for the Jinsha River, a tributary of the upper Yangtze River, could spell disaster. Reports on dam construction in western China’s seismic hazard zones and the risks of over-damming, released by Probe International earlier this year, are highlighted. As the last of the turbines at China’s Three Gorges Dam was connected to the grid on Wednesday, a dams debate rages over the fate of the Upper Yangtze River and its main western tributary, the Jinsha River. The Jinsha River flows through the Three Parallel Rivers World Heritage Site. Known as the “River of Golden Sands,” the Jinsha is slated for a cascade of 25 dams designed to generate as much electricity as four Three Gorges Dams put together. After years of cautious construction and banning projects that either started illegally or had soaring cost overruns due to poor resettlement and environmental management, the government has identified the Jinsha as one of several dam-building hotspots to meet its goal of adding 140 GW of hydropower capacity by 2015. Scientists and environmentalists in China fear that the cumulative impacts of this dam cascade could spell disaster not only for the health of China’s largest river but also the safety of downstream populations and the future water availability for the region. According to Mr. Yang Yong, chief scientist at the Heng Duan Shan Society, the 25 proposed dams would slice up the rapidly flowing Jinsha River into a series of stillwater reservoirs. This drastic change to the hydrology of the river basin would fundamentally alter the habitat and lifecycles of state-protected fish like the Chinese paddlefish and the Dabry’s Sturgeon. Experts also warn against the risk of dam-building in China’s seismically active and flood-heavy southwest, where one dam break could cause a tsunami that creates a domino effect of collapsing dams downstream. This occurred in China in 1975, when a major flood and poor communications caused dam breaks at 62 sites in Henan Province. The catastrophe killed over 26,000 people – more casualties than any other dam failure in history. While such massive floods are rare (this was a once-in-1000-years flood), dam developers have yet to factor in the affects of climate change on extreme weather events such as droughts and floods, which are common in the southwest and have serious implications for dam operation. 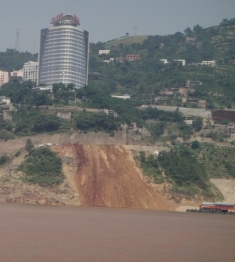 Landslide caused by fluctuating levels at the Three Gorges reservoir. Early last month, China Three Gorges Project Corporation, the Ministry of Water Resources’ Changjiang River Scientific Research Institute, and WWF jointly published a report called “China’s Environmental Flows Research and Practice.” The report concluded that there were already too many hydropower plants on some parts of the Upper Yangtze River and that untrammelled development was affecting the basin’s ecological balance. Despite these warnings, large-dam cascades are being proposed for several of China’s rivers, as well as for river basins in the Mekong, Brazil, and elsewhere. The true cost of over-damming these vital basins would be ecosystem collapse, social upheaval due to massive relocations, the unnecessary risk of dam-related hazards, project cost overruns, and poor returns on investment. When better water and energy solutions exist (in China see for instance Energy Transition Institute), the long-term costs of these risky ventures is just not worth the short-term profits.